Nil-Cor offers a choice of six ball valve models in a selection of corrosion resistant advanced composite materials and sizes to meet the requirements of the chemical process industry. All Nil-Cor ball valves feature lightweight, corrosion resistant bodies and a lock-out provision as standard equipment. 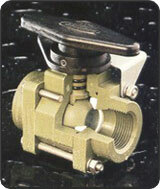 Nil-Cor ball valves are available in sizes from l/2" through 10", with lever or gear manual operators. Automated valves can be expertly factory assembled with pneumatic, electric or hydraulic actuators and accessories per customer specification. Available in sizes 1” through 10” in ANSI B16.5 Class 150 flange drilling, as well as DIN PN 10 and PN16, and JIS 10K. Nil-Cor valves are 1/3 the weight of metal valves. This low weight saves money in piping supports and makes Nil-Cor Ball valves ideal for use on plastic and FRP flanged piping systems. There are no wetted metallic components in the Nil-Cor ball valve, ensuring outstanding corrosion resistance. All valve materials have unique color coding for easy field identification. Service to 300° F.
Nil-Cor Flanged ball valves feature a one-piece body, eliminating the leak path inherent in a body joint. Nil-Cor face-to-face dimensions meet ANSI B16.10. Our streamlined standard port design delivers low pressure loss while keeping actuation torque and cost to a minimum. To impart ruggedness and durability, our composite valve body is designed with heavier wall and flange thicknesses than metal or plastic valves. All Nil-Cor valve stems are blow-out proof for safety. Nil-Cor offers the only standard Self-Relieving seat in the industry, eliminating the need to drill holes in the ball for cavity pressure relief. Our optional Cavity Filler CF seat sets the design standard for rugged, durable performance in slurries and dirty services. Nil-Cor Flanged Ball Valves are available in either glass or graphite fiber-reinforced vinyl ester or novolac epoxy, as well as glass fiber-reinforced polysulfone. The balls in Nil-Cor ball valves are made from fiber-reinforced resin providing both strength for resistance to torsional actuation loads and lubricity to minimize actuation torque. The graphite reinforcement also reduces potential fouling since line media tend not to adhere to it, and the seats easily wipe clean further minimizing breakaway torque. Our stem features a massive Hastelloy®-C insert for outstanding strength and corrosion resistance. The packing gland and gland bolts are Hastelloy®-C to ensure corrosion-free operation in the harshest environments. Available in ½", ¾", 1", 1½" and 2" sizes for corrosive chemical service, particularly in sodium hypochlorite systems. It is available in our 410 body material (glass fiber reinforced polysulfone resin). Modified versions can be equipped with end caps of PVC, CPVC or other materials to facilitate adaptation to the piping system while maintaining the benefits of the tremendously strong and versatile polysulfone body, ball and encapsulated Hastelloy®-C stem. With all-410 construction, short term exposure to 300°F is acceptable. Exposure above 325°F should be avoided. Valves have standard NPT ½", ¾", 1", 1½" and 2" end connections. 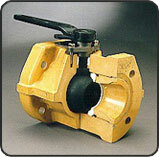 Valve sizes ½", ¾" and 1" have regular port one inch balls in the center body section. The 1½"and 2" valves are regular port. The three-piece design permits assembly to replace all parts without machining or bonding or unthreading pipe connections. The 410 body, end caps, ball and Hastelloy® "C" stem insert are molded in the 410 composite material. The TEBV incorporates a graphite fiber-reinforced TFE stem thrust washer, self-relieving virgin TFE seats, FKM elastomer stem and body O-rings, composite handle, and 300 series stainless steel body bolts, nuts and washers. Modified versions can be equipped with end caps PVC, CPVC or other materials. Optional body bolt materials include Hastelloy®-C and titanium.